- marinade chicken mince with salt & pepper and a little oyster sauce. - preheat pan with 1/3 cup oil, stir in the pumpkin and fried untill a little brownish. 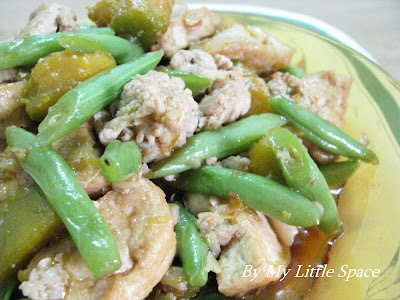 - remove pumpkin from the pan, then stir in ginger, garlic, green beans and chicken mince. - simmer untill cook, then add in fried bean curd & pumpkin. - stir fried for about 2 mins over medium heat and add in all the seasoning & thickening. - off the heat once the sauce became a little thicken (make sure it's not too dry). This dish is definitely easily go with plain rice, since it's all in one dish! Enjoy....! 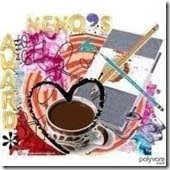 The following award was given by Anncoo from Anncoo's Hobby to all her foodie friends. I'm quick enough to grab it back. Thank you! Her blog got plenty of yummy food and recipes. You guys should check her out. And in return, I'm giving her a befriending award. 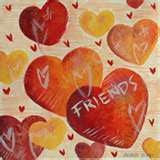 Thank you so much for being friend and sharing. Muchas Gracias! This would be a fantastic dinner. Definitely a new use for pumpkin here. Great idea. 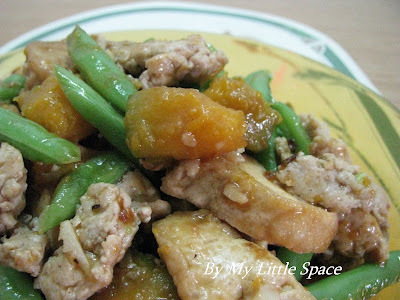 I love pumpkin, green beans & tofu! This is a wonderful stir fry & I cld have a big bowl of rice with this dish! The combination is unusual, but it looks and sounds delicious.